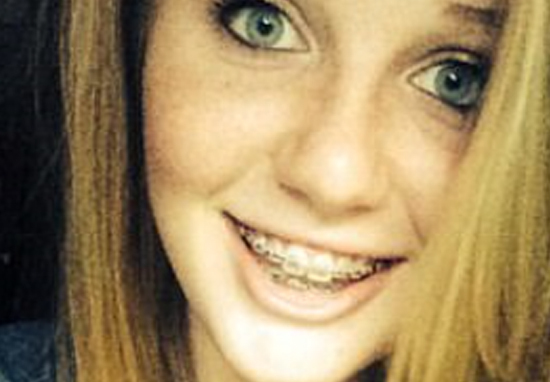 A cruel student has bragged about rubbing a used tampon on her roommate’s bag in a bid to get her to move out. White Freshman, Brianna Brochu, from the University of Hartford, subjected Chennel ‘Jazzy’ Rowe – who she referred to as, ‘Jamaican Barbie’, to a sustained campaign of abuse. The girls had been placed together at random and Jazzy says she felt ‘unwanted’ from the very beginning, feeling like a ‘ghost’ in her own room. Jazzy believes the abusive behaviour was racially motivated and has criticised the university for their response, which she feels would have been much different had this been a case of a black woman targeting a white woman. After having made the decision to move out, Jazzy was left disgusted when Brianna made an Instagram post detailing some truly repulsive acts of bullying. Finally did it yo girl got rid of her roommate!! 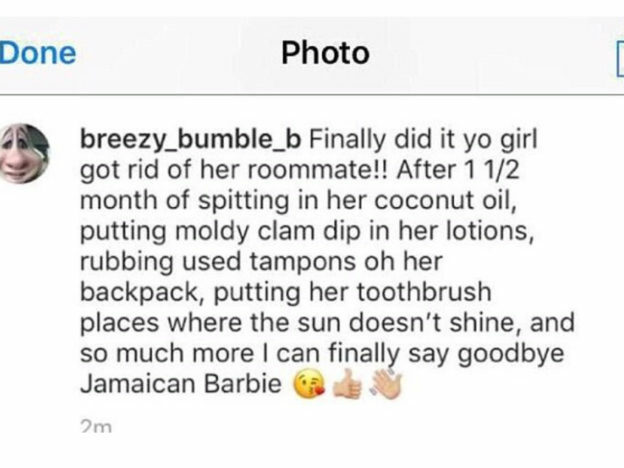 After 1 1/2 month of spitting in her coconut oil, putting moldy clam dip in her lotions, rubbing used tampons on her backpack, putting her toothbrush places where the sun doesn’t shine and so much more, I can finally say goodbye Jamaican Barbie. Emotional distress aside, Jazzy has become concerned about the toll Brianna’s actions could’ve had on her physical health. It started with throat pain, I thought maybe because it’s colder up here, I’m just catching a cold. After a month it got to the point where I had extreme throat pain that I couldn’t sleep, to the point where I couldn’t speak. I’m spending my own money that my parents give me for food and groceries, on the health centre on campus, it’s not free – in fact they’re expensive. Brianna was arrested on 28 October on charges of third degree criminal mischief and second-degree breach of the peace – both charges carry maximum six-month jail sentences. She’s since admitted to licking Jazzy’s plate and cutlery, as well as rubbing a bloodied tampon on her bag. However, she’s denied the rest of the claims, explaining the rest of her boasts were merely attempts to appear ‘funny’. She’s also stated she’d not intended to cause Jazzy any harm. Let me repeat; racism and hatred will not be tolerated on this campus. Period. I encourage every one of you reading this email to report incidents on campus that are troubling and worthy of review. I will proactively schedule and communicate additional community conversations in the coming days. I am willing and prepared to openly discuss concerns and will transparently share any additional information about University resources and processes that will make our community stronger. We pride ourselves on the diversity of our University and I am confident we provide a secure environment for our students in which to learn and thrive. Our community is not exempt from issues facing our society and world. We must strive every day to practice understanding, tolerance, inclusion, and grace. I know that you will join me in this critical mission. If you’ve been affected by any of the issues raised in this article, then the Samaritans are available to speak with you at any time on 116 123.